A new Australian study could change the type of oils you use for cooking. Researchers found that extra virgin olive oil is the most stable and safest to use at high temperatures. Cooking with coconut oil was almost on par, however failed to come close when comparing levels of naturally occurring antioxidants. Seed oils (also called vegetable oils) such as canola oil, grapeseed and sunflower oil were the least stable when heated and produced the most harmful compounds. Researcher’s also found that an oil’s smoke point is a very poor marker of its safety and stability as a cooking oil, contrary to popular belief. This is a detailed look at some of the main results as well as a Q&A with the lead author. So What Is The Healthiest Cooking Oil? Each oil was subjected to two different heating trials before being cooled at room temperature and stored until chemical analysis. The first trial consisted of gradually heating 250 mL (8.5 oz) of each oil in a pan fryer from 25ºC to 240ºC (77ºF to 464ºF), collecting samples at different heat intervals. For the second trial, 3 L (100 oz) of each oil was heated in a deep fryer at 180ºC (356ºF) for 6 hours, collecting samples at different time intervals. This is the recommended temperature for deep frying. Researchers analyzed a range of quality markers before and after each trial. Analyses were performed on standard supermarket products by an ISO17025, NATA and AOCS accredited laboratory. Summary: Ten popular cooking oils were put to the test with two different heating trials. The first trial gradually heated each oil to 240ºC (464ºF), the second heated each oil in a deep fryer for 6 hours at 180ºC (356ºF). Each oil was then analyzed for a range of quality factors. Heating an oil increases the rate at which it reacts with oxygen and breaks down (known as oxidation). Therefore, the better an oil can resist oxidation the better it is for cooking. This quality is measured as oxidative stability (1, 2). Typically the more saturated fat and monounsaturated fat in an oil, the better its oxidative stability. Data from this study showed that coconut oil had the highest oxidative stability. This is due to its extremely high saturated fat content (about 92%), which makes it solid at room temperature. Oxidative stability (measured as induction time) of each oil before heating trials. Click to enlarge. Peanut oil was second followed closely by extra virgin olive oil, both of which are rich in monounsaturated fats, particularly oleic acid. The seed oils and avocado oil scored very low. Summary: Oxidative stability is a measure of how well an oil resists reacting with oxygen and breaking down. Coconut oil scored the highest due to its high saturated fat content. Peanut oil and extra virgin olive oil also scored well. This is arguably the most important factor. When it comes to health the priority is to choose a cooking oil that produces the lowest amount of harmful polar compounds after heating and oxidation. Polar compounds are the potentially harmful compounds produced when an oil breaks down under heat. Toxic by-products such as lipid peroxides and aldehydes are produced, which are consistently linked to serious diseases (3, 4, 5). These charts illustrate the number of polar compounds that formed in each oil during trial 1 and trial 2. 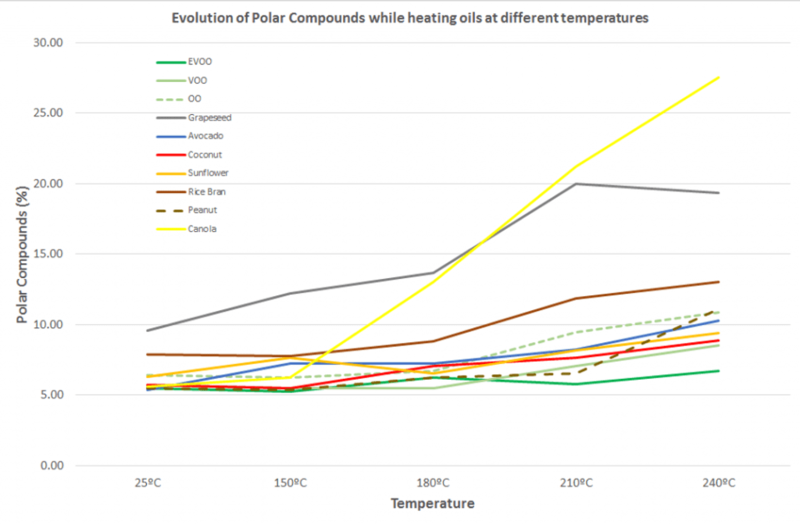 Change in polar compounds of each oil as cooking temperature was increased. Click to enlarge. 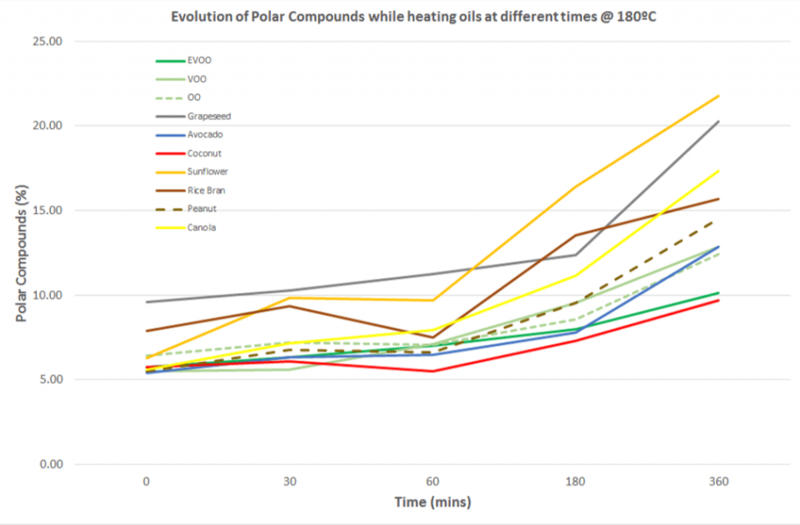 Change in polar compounds in each oil over time during deep-frying at 180ºC (356ºF). Click to enlarge. 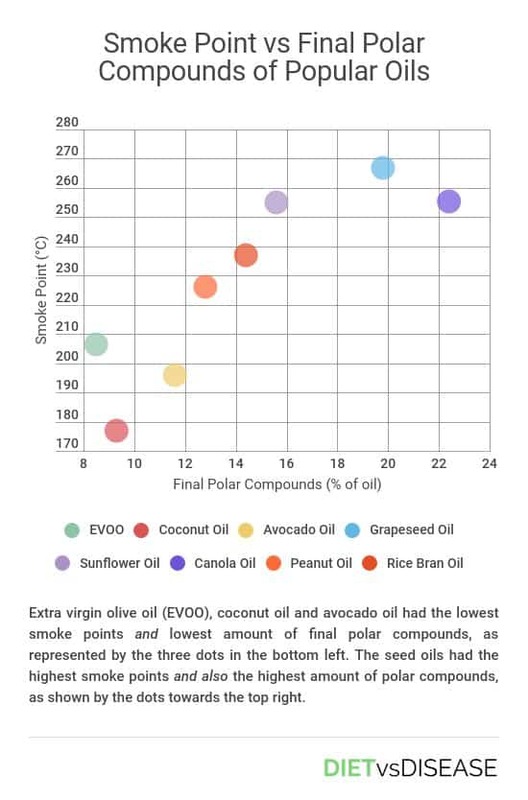 On average it’s clear that extra virgin olive oil and coconut oil formed the fewest polar compounds over the two trials. Worryingly, canola oil demonstrated a rapid increase in polar compounds when heated from 150ºC to 240ºC (trial 1), reaching a value of 27.5%. This is above the limits permitted safe for human consumption (6). 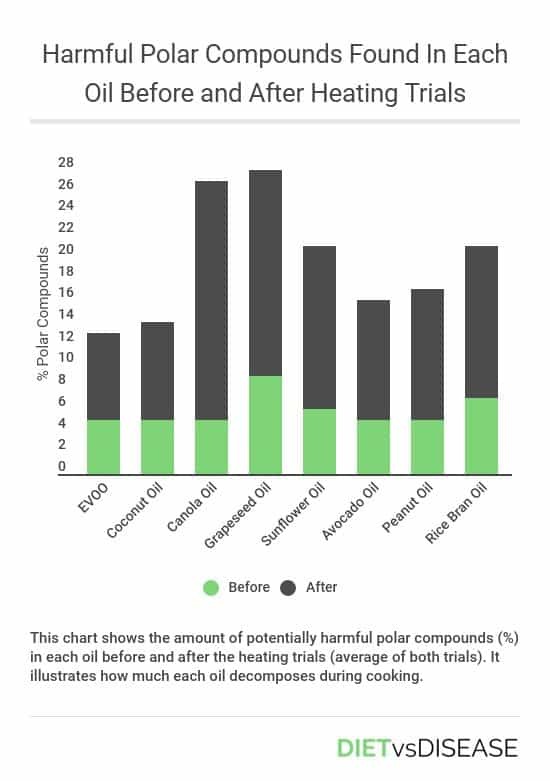 This bar chart further compares the average formation of polar compounds over the two trials for the best and worst performing oils. Interestingly, the worst performing oils all had the highest smoke points, which we’ll touch on further below. Summary: Polar compounds are harmful compounds produced when an oil breaks down at heat. 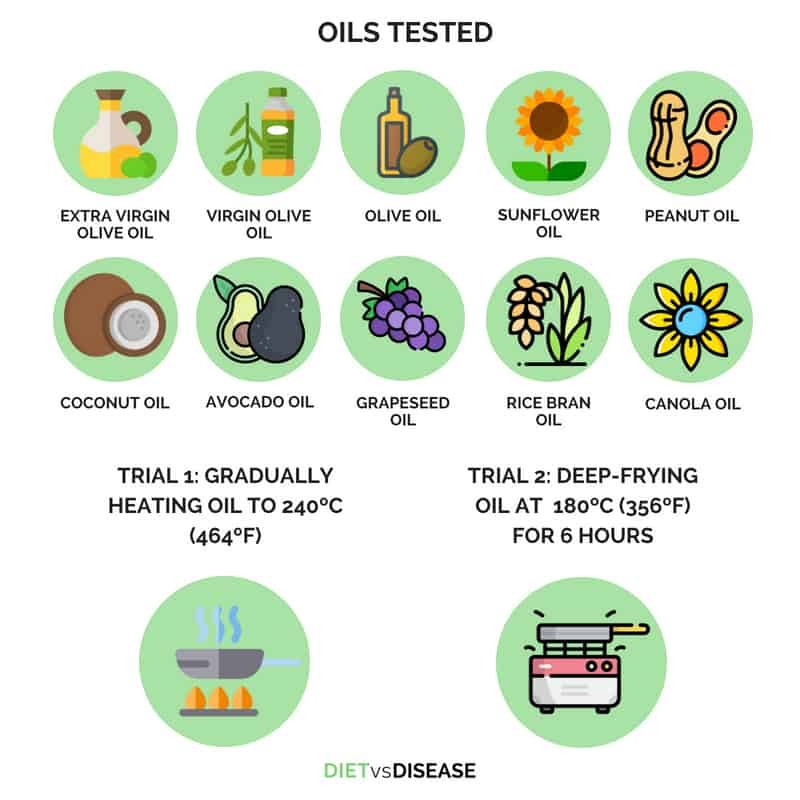 Over the course of both heating trials, extra virgin olive oil and coconut oil produced the least polar compounds, while seeds oils like canola oil produced the most. As the name suggests, antioxidants fight against oxidation and improve heat stability. They also protect an oil’s nutrients and add to its health profile, which is why oils naturally rich in antioxidants are desirable. Preliminary data showed the three olive oil grades (extra virgin, virgin and olive oil) contained far more antioxidants than others at initial measurement. Extra virgin olive oil in particular had the highest levels, with 18 times canola oil and a whopping 700 times coconut oil. This makes sense considering it’s one of the few sources that contain squalene and significant quantities of vitamin E (listed as tocopherols). Click to enlarge. Preliminary results from the Evaluation of chemical and physical changes in different commercial oils during heating Authors: De Alzaa, F.; Guillaume, C.; and Ravetti, L.; Modern Olives (2017) – Analyses performed by ISO 17025, NATA and AOCS accredited laboratory. All non-olive oil varieties contained very few antioxidants as they are not naturally rich sources (and the seed oils are refined). Interestingly, coconut oil ranked the lowest of all oils tested for antioxidant content. Contrary to all the misinformation online, coconut oil (both refined and virgin) is an extremely poor source of antioxidants. Multiple studies can confirm this, and it makes sense because we know it contains only trace amounts of vitamin E and polyphenols, and zero squalene (7, 8). Like coconut oil, avocado oil is also not a rich source of antioxidants. The fruit itself has little to begin with, and only a fraction of that amount is transferred from the fruit to the oil during the extraction process. For example, the flesh of an avocado contains only 0.55mg/100g of biophenols (a type of antioxidant), while the flesh of an olive contains a staggering 2,500mg/100g (9, 10). That’s why it’s almost impossible to eat a raw olive, while raw avocado is an absolute delight. 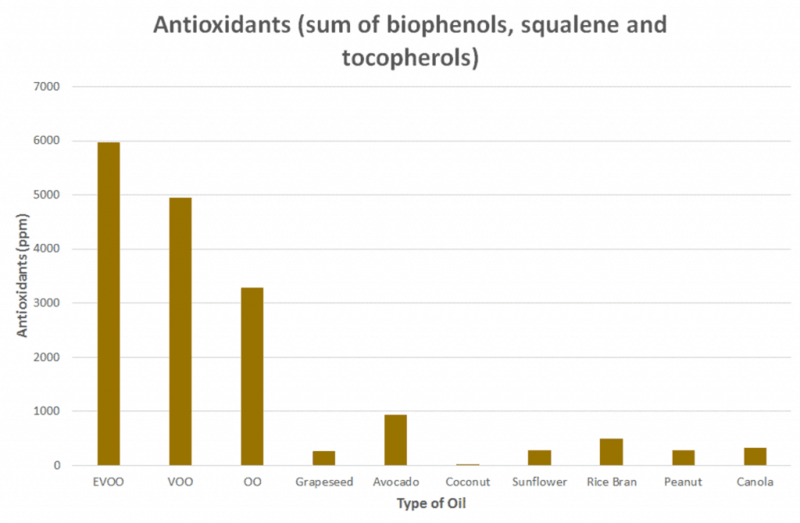 Summary: Antioxidants help protect the oil against oxidation and add to its health profile. The antioxidant content of extra virgin olive oil was overwhelmingly greater than all the seed oils, avocado oil and coconut oil combined. Smoke point is defined as the temperature that an oil begins to continuously produce a bluish smoke. As you might expect, this indicates a rapid chemical breakdown of the oil and the production of toxic by-products (11). For this reason a high smoke point has always been considered a crucial factor for choosing a cooking oil. Search any ‘best oil for cooking’ article and you’ll see it emphasized. I was taught this as well, but it seems that we were all wrong (yay science!). In this study oils with the highest smoke points – such as canola oil, sunflower oil and grapeseed oil – also produced the highest levels of polar (harmful) compounds in both heating trials. If a high smoke point did accurately represent an oil’s stability at high heat, the seed oils would produce the lowest levels of polar compounds after cooking, not the highest. Using smoke point to rate an oil’s suitability for cooking is explored in more detail below in the Q&A with the lead author. Summary: This study found that oils with the highest smoke points had also produced the most toxic by-products after heating to regular cooking temperatures. This shows that smoke point is a poor marker of the safety and stability of a cooking oil. The results found that extra virgin olive oil was the most stable and safe for cooking, followed closely by coconut oil. 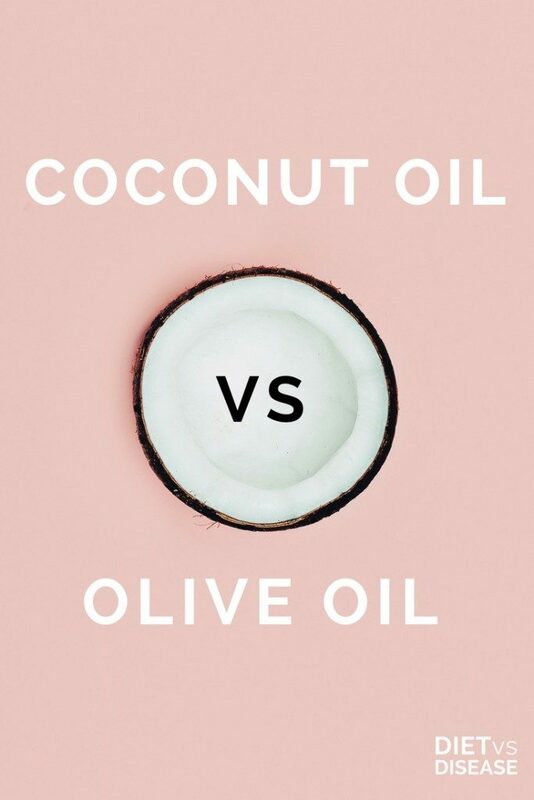 Coconut oil has a greater oxidative stability, but extra virgin olive is a profound source of antioxidants that protect against heat damage and likely have health properties. In contrast, canola oil and other seed oils have poor oxidative stability and virtually zero antioxidants. This means they break down easily with heat and produce much larger amounts of toxic by-products… even despite their higher smoke point. Lastly, note that extra virgin olive oil is very different to virgin olive oil and refined olive oil. It’s a far superior choice and contains many more positive attributes due to the way it’s extracted and produced. I asked the lead author of this study to clarify some questions. The answers have been lightly edited for clarity. Q: How come the coconut used in this study was refined and not virgin? The idea was to test the ten most popular and widely available oils on the supermarket shelves. Refined is much more accessible than virgin coconut oil here. For the record, there is not much difference between the two, and we’d expect the results to be very similar regardless if it was refined or virgin. Their fatty acid composition is almost identical, and both varieties contain only trace amounts of antioxidants. We would assume refined is slightly worse with cooking because it causes secondary products of oxidation (additional toxic by-products). Q: Coconut oil appeared to be on par with EVOO when you consider the markers tested after heating. What is the main benefit of using extra virgin olive oil over coconut oil? During any cooking process, when oil is the heating medium (i.e. deep frying), two phases typically occur. The first phase is where water evaporates from the food being cooked, and this commences once the oil reaches 100ºC, and continues until most of the food moisture has evaporated. The second phase is that during which the food absorbs and releases (in the case of fatty foods) fat. This second process determines the changes in fatty acid composition of the food which occurs during the cooking process. It has been well documented that the fatty acid profile of the food after deep frying is closer to that of the oil used to fry the food than that of the raw food itself. Furthermore, despite the impact that heating has in reducing the antioxidant content in EVOO, a significant amount of substances related to health benefits such as biophenols, tocopherols, sterols and squalene still remain in EVOO after heating, and they are absorbed by the cooked food. When food is cooked with EVOO it is healthier than if cooked with other oils that have a different fatty acid profile, or contain lower amounts of natural bioactive substances. You may be interested in reading this article, where we explained the main differences. Q: Your results showed that oils with a higher smoke point tended to be higher in harmful polar compounds. Does this mean smoke point has no place as a marker of an oil’s cooking quality or suitability? As an oil is heated, smoke point changes and oils which are less stable under heat (seed oils with higher levels of polyunsaturated fats) lower their smoke point more rapidly than more stable oils (extra virgin olive oil). Smoke point is not a constant value throughout the cooking process. The free fatty acid (FFA) fraction (that strongly determines smoke point temperatures in most oils) represents less than 1% of the total mass of oil. Consequently, when smoke is seen, this is indicative of the behaviour of a very small percentage of the total oil under heat, and not the degradation of the fat itself. The smoke point is determined in an enclosed environment, using only a very small volume of oil in a small brass capsule. It has been documented that the smoke point significantly increases where there is a larger recipient, larger volume of oil heated, and in the presence of air. Consequently, oils under normal cooking conditions can reach significantly higher temperatures than those typically reported as their smoke points. Most refined oils (which have a high smoke point due to the neutralisation process of the FFAs) also have significantly higher levels of secondary products of oxidation than virgin oils, due to their exposure to extreme high temperatures through processing methods. These secondary products of oxidation, such as alcohols, ketones, aldehydes and acids can have a detrimental effect on health and/or recombine to produce polar compounds at a faster pace than virgin unrefined oils. Q: Does the majority of home-cooking occur at temperatures lower than the average smoke point of an oil (200 degrees C or so)? I believe that in home-cooking, we don’t use stress conditions that may rise concern. That’s to say the time and temperatures reached are not probably enough to cause high accumulation of degradation products in the oil (at the point to make it unhealthy) and their eventual absorption in foods. Q: These oils were tested without any food cooking in them. Had the tests been done with food, would you expect the oils to perform better or worse? We are currently working with food, as in this study, the absence of food may have allowed for a greater impact of oil oxidation when compared with other deterioration reactions. Thus, I expect oil’s behaviour to be different. The addition of food will decrease the oil’s temperature and might slow down its deterioration (when comparing same study conditions). However, oil’s deterioration will still happen. The water content of food and steam will promote the hydrolysis process, in addition to the other chemical reactions such as oxidation (increased addition of oxygen as the food is added to the oil) and polymerization. It is important to consider the type of food that you are cooking as they will have more or less water content, different fatty acid composition, shape, etc. and they will interact differently with the oils. At the same time, don’t forget that you need some chemical changes to occur to get the brown colour and the particular fry taste/flavour in the food as well as allow the transfer/absorbance of the oil good properties into the food. This research was conducted by Modern Olive Laboratory Services, which has raised some eyebrows. Some of Modern Olives’ research work has been privately funded while other work has received industry and/or government funding. Modern Olives privately funds research needed to fill specific knowledge gaps that wouldn’t normally attract industry or government funding. In other words, really detailed studies that compare different oils has to be funded by an organization in the oil industry because governments are not really interested. Modern Olives Laboratory Services is independently operated and holds accreditation with leading authorities including NATA, AOCS, IOC and ISO. It’s been awarded the world’s most accurate laboratory by AOCS (American Oil Chemists Society) three times in the past 10 years. This research builds on the existing body of research (from other labs) that support best predictors of an oils stability when heated. A lot of the findings has confirmed what we already know (or should have known). This research, like previous research undertaken by Modern Olives, is currently undergoing peer-review which will allow the research to be validated and replicated by others. Extra virgin olive oil was the most resistant to heat and therefore the healthiest cooking oil. It was followed closely by coconut oil and the other virgin olive oils. Seed (vegetable) oils produce the most harmful compounds and are a poor choice. Oils with a high smoke point (typically refined seed oils) still produce the most harmful compounds when heated at regular cooking temperatures. This means smoke point is a poor indicator of an oil’s cooking qualities. Ultimately, if I had to choose one overall winner it would be extra virgin olive oil. It’s more stable than coconut oil for cooking, it’s superior when it comes to potential studied health benefits – antioxidant content and oleocanthal may be particularly responsible for this – and is much more versatile to use (on salads and bread for example). We must also consider that many of an oil’s compounds are absorbed by the food it’s cooking, including the antioxidants. So it makes sense to cook with a high antioxidant oil like extra virgin olive oil. Getting authentic EVO is not easy according to reports, as so many brands adulterate with cheaper oils. Getting good coconut oil is much easier. Coconut oil has other benefits and has helped me tremendously. Do you find there could be a strong result bias due to the fact that the study is undertaken by an organisation promoting the olive industry in Australia? The avocado oil in the study is 196 degree smoke point and mine is 520 degrees. This is a huge veriation since as you reported smoke points are determined in a closed environment. I have not seen a lower smoking point avocado oil. Do you know any specific brands that are. This concerns me because mine has a higher smoking point are you saying then it’s refined going through a neutralization process to give it high heat? Oil (i spend good money on the best quality which shows expiration date, etc, and dont rely on common grocery store brands) is what i prefer to ingest. Thanks for posting! Do the anti-oxidants of an oil survive the high temperatures? 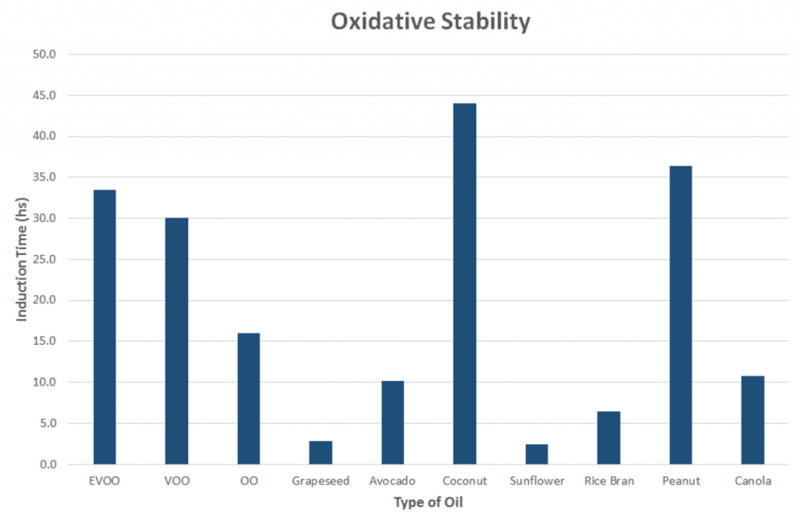 Was the survival of anti-oxidants tested? Also, perhaps the anti-microbrial properties of the lauric acid in coconut oil should have been considered. The study found that seed oils produced the most harmful compounds, but at what amount is it harmful to health? When you consider that most cooking only requires a teaspoon of oil, is it really having a significant impact on health? By the same token, does EVOO really have much of an impact on health when you put it in the context of overall diet and lifestyle? 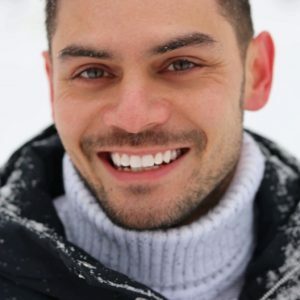 This article implicates the proportion of unsaturated fats in the creation of polar compounds, and thus, toxicity and holistically adverse effects on health. However, conventional wisdom often states that saturated fats themselves cause much greater negative impacts on overall health by increasing the risk of cardiovascular disease (amongst others). Medical, governmental, and inter-governmental institutions generally agree with this assessment, and have served as its proponents by issuing official statements and dietary guidelines recommending limitations in saturated fat intake. How, if at all, do you reconcile the apparently contradicting implications of these two viewpoints? Taking this apparent conflict into account, does the positive assessment of highly-saturated options such as coconut oil still stand? Was this article written specifically to deal with one aspect of each oil’s potential toxicity? Or have the other implications of each oil’s composition been adequately considered?